This is perhaps the most straightforward of the three. Managing contracts manually takes a lot of time. Between filing the contract upon its execution, looking it up to reference any specific terms or milestone dates, finding contracts at the request of other departments, etc.- a lot goes into the management of contracts. With a secure, central, searchable repository and alerting contract management software can greatly reduce (and nearly eliminate) the time listed for all of the above. How do you know if the investment makes sense for your company? Here's a basic formula: Multiply the number of hours a month you spend completing the above tasks by what you get paid on an hourly rate. Now multiply this by 12. That is the annual savings for just you alone- this doesn't include any of your colleagues. Now do the same for your colleagues or others involved in the process- you can see that the time savings add up rather quickly. Missed milestone dates on contracts can have a substantial impact on the overall ROI of a company's contracts. Many contracts with vendors are autorenewing, and if you miss the date to cancel the service or subscription, you are legally obligated to pay for another contract term. As the volume of your company's contracts grows, the more likely it is that a date will slip through the cracks, especially since a majority of companies still use spreadsheets to track contracts and their milestone dates. If you have a bill for some type of software, as an example, that costs $24,000 a year and you miss the 45 day cancellation window, you are on the hook for another 24K, whether or not you use the software. If a company has ever missed a milestone date, they are acutely aware of this pain and have little problem seeing the ROI in contract management. And even for a company that has never missed a date, as the contract portfolio grows, the likelihood of missing a date goes up. Most contract management software solves this problem by having an alerting and email notification system for upcoming milestone dates. How to calculate the ROI: If you've ever missed a contract, use the amount that the contract cost you. 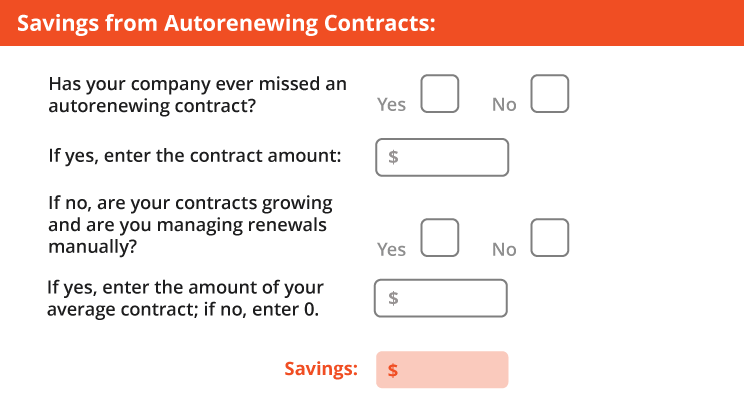 If you haven't and your contracts are growing and you manually manage renewal dates, the likelihood that your company could miss a date is high, so use a dollar amount that represents the average value of your contracts. This is a problem that, from the outside, seems fairly easy to avoid. Don't buy a service if your company already has a vendor providing the same service. In reality, though, this is much harder to ascertain than it seems. Companies grow. Different departments purchase different software. People come and go from jobs. In all of this change, having a solid understanding of what's in a company's contract portfolio requires diligent oversight and that's hard to obtain without a central contract repository and reporting capabilities. We have one client who paid $80,000 for a duplicative service! Contract management software, with it's reporting capabilities, allows you to easily see the contents of your company's portfolio or search for specific contracts, eliminating the possibility for purchasing duplicative services because you didn't know a contract already existed with another vendor. How to calculate this cost: If you've ever paid for a duplicative service, enter this amount. 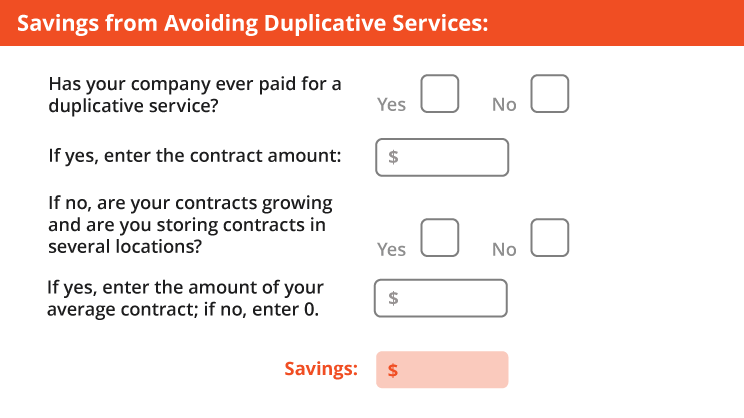 Per the previous scenario, if you haven't paid for duplicative service but your contracts are growing and you don't have a centralized place to store them and a simple way to report on them, enter the average cost of your contracts. Contract management software is an investment, not only financially but in the time expense to customize and implement the system, upload legacy contracts, and train users. However, with advances in technology, gone are the days where the only contract management software options are clunky, complicated, and excessively expensive solutions. ContractWorks is affordably priced at only $500/month for unlimited users and unlimited contracts, and we're proud of our short implementation time. Companies get up and running in minutes. 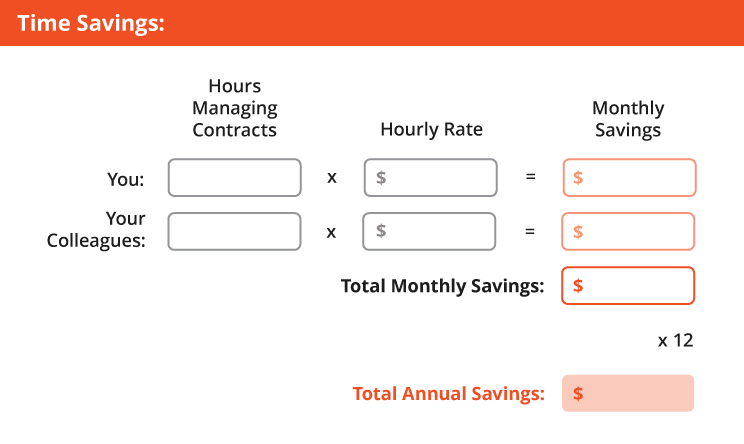 Using the above ROI calculator, what type of savings could you realize with the implementation of a simple, effective, contract management solution?